This year, having resolved to be mindful of the patterns set into motion by my intentional choices, I’ve started keeping a daily list of past intentions that I discover manifesting themselves in the present. One of the list’s first entries was the wonderful supportive community of blogging friends who became part of my life two years ago, when I went looking for positive blogs to brighten my attitude. 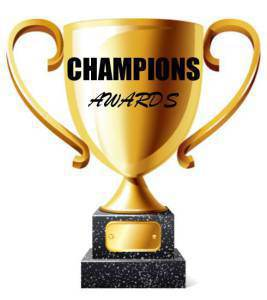 And shortly after I wrote that entry, Elizabeth at Tea & Paper wrote a post in which she nominated my blog for the Champions Awards. 2. Acknowledge the sponsor of your Awards. 3. Choose at least five of your own nominees and advise them accordingly, attaching these 5 guidelines. 4. Keep it simple… no need for explanations for the Awards… we know how great these folks are. Meg! What an honor <3 Thank you so very much for being such a constant supporter of my blog & source of inspiration. I really appreciate the time you take to thoughtfully comment on my posts and of course to include me in this list 🙂 Looking forward to see what the new year will bring for us all!